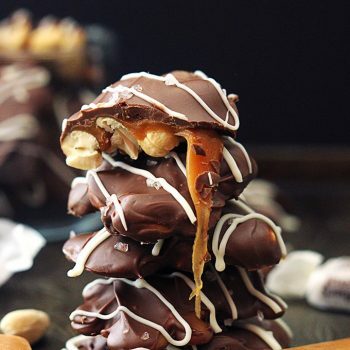 These no-bake chewy caramel cashew cluster candies only require 3 ingredients! Chill them for a fun summertime treat! I’m in one of those prolonged food moods. You know those weeks when each and every time you’re feeling hungry (annnnd all of the rest of the time when you’re not actually hungry but want to eat anyway) you keep going back to the same food that sounds good? Sometimes I get on a peanut butter kick. Sometimes it’s salt & vinegar kettle chips (oh my gosh I could eat those for yearzzz). But this week, it’s caramel. My family spent the 4th of July weekend at the cabin. I love going to the cabin because it’s so relaxing and a complete break from the “real world” – the one in which I have to answer emails all day long and check my Pinterest feed and shop for shoes and upload a million Instagram pics and submit 14-page research papers for school. The reason I get a break from all of that stress when we are at the cabin is simply because there is ZERO internet up there. Zilch. Nada. None. The closest place you can get internet is probably 45 minutes away. It can be a curse and a blessing, it goes both ways. I get frustrated when I feel like I need to be in touch with the outside world. But on the other hand, I have absolutely no self control and am a workaholic so if you don’t make it virtually impossible for me to work, I will do it anyway, regardless of whether I’m on “vacation”. I sound like a terrible person! I’m not I swear, just passionate and maybe a little anxious. There is also probably some OCD mixed in there, wouldn’t surprise me. While we were internet-vacationing at the cabin, we went target shooting. You wouldn’t think a little thing like me would be interested in shooting a 22 or a revolver but I gotta tell ya, I’ve loved it since I was a kid. I’ve never hunted, but like I said we go target shooting. The “target” can be just about any non-living thing but usually ends up being an empty soda can or a bulls eye taped to a dead tree. So long story short, my pops was about to take a turn so I ran up to where we had all of the targets and set them back up. While I was up there I spotted an old plastic cap, about the size of a quarter, lying in the dirt. So I picked it up, sat it on a log and when I got back to base I told Pops if he could shoot the hidden cap I’d put up there I would give him something special. Wellllll he shot it. And since I wasn’t quite expecting that, I had no definite plans for what to give him. So I was standing there thinking, what on earth could I give my pops that he would like and think is special? CHOCOLATE. Duh. The man lives for chocolate. But I said it would be special so I felt like I should at least make it myself. 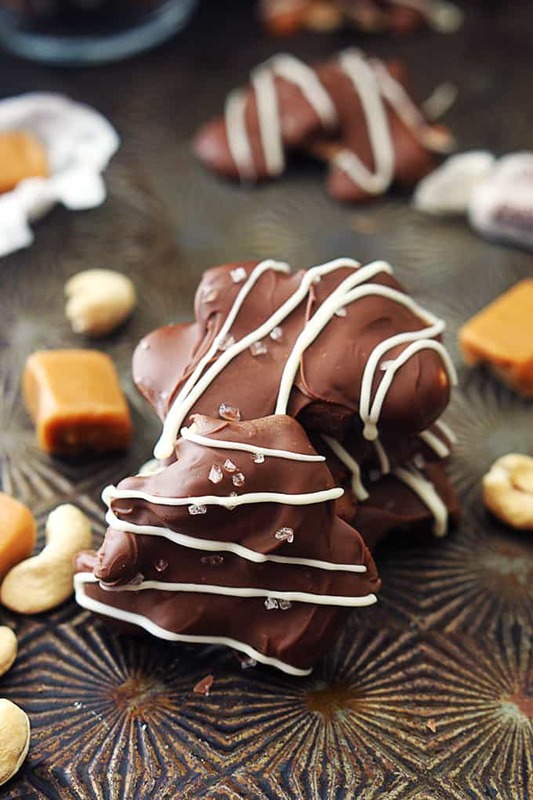 I considered fudge, and I was tempted to do a batch of cookies, but when I thought of these caramel cashew clusters it was game over – I had to make them. They were ten times easier that I expected them to be and they only require 3 ingredients! Which is a very good thing since my husband took the liberty of eating my pops’s bag of these babies so I had to whip up another batch yesterday. Took me 20 minutes including cooling time. Dangerously quick I tell ya – move over swimsuit! Spray a baking sheet lightly with cooking spray. Make little piles of 5-7 cashews until you've used up all of the cashews. Place caramels in a microwave safe bowl. Microwave on high 2-4 minutes until completely melted. (The caramels will foam a lot, this is normal.) Stir until smooth. Spoon about 1 tablespoon (doesn't need to be exact) of caramel onto the top of each cashew pile. Place baking sheet in the fridge or freezer. Melt chocolate chips in a microwave safe bowl at half power for 2 minutes. Stir and microwave another 20 seconds. Stir again until smooth. Spoon about 1 tablespoon (doesn't need to be exact) onto the top of each caramel cashew cluster. 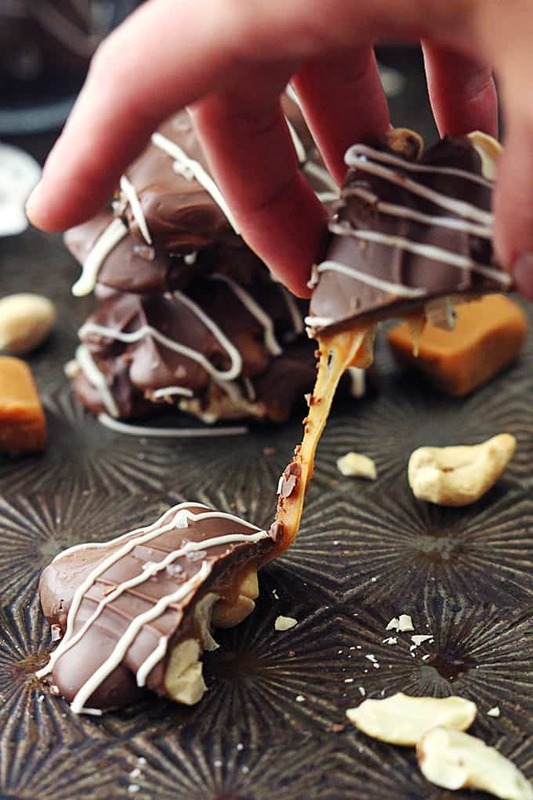 Use the spoon to spread the chocolate a bit so it covers the top of the cluster. Chill 10 minutes. Store at room temp or chilled in an airtight container up to 2 weeks. Enjoy! 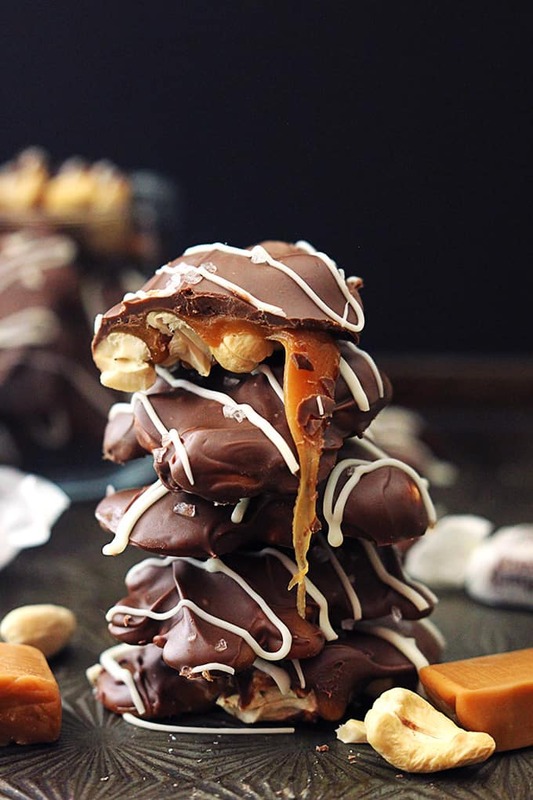 Optional: Immediately after pouring milk chocolate over the caramel clusters, sprinkle with sea salt. Allow to cool for a few minutes, then drizzle with melted white chocolate. 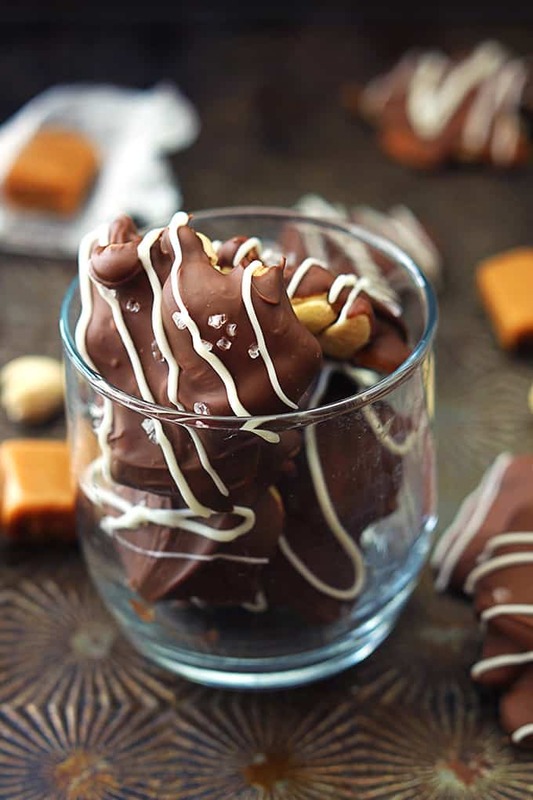 ***tip: if using harder caramels such as the square ones that come individually wrapped, add 2-3 tablespoons of milk or heavy cream to the bowl when microwaving, this will help to keep the caramel soft! What brand of hard caramels did you use? Does the caramel stay soft once candy is made? I see my name written all over these. Quick and easy is what I so need right now, thanks. I could eat the whole batch of these! Dangerously delicious and gorgeous photos! These look delicious! These remind me of turtles which I love. I’m definitely going to have to make this sometime. Plus these would make an excellent birthday gift and I’ve got plenty of those coming up! these look TOO good! and only 3 ingredients?! wow! OMG! 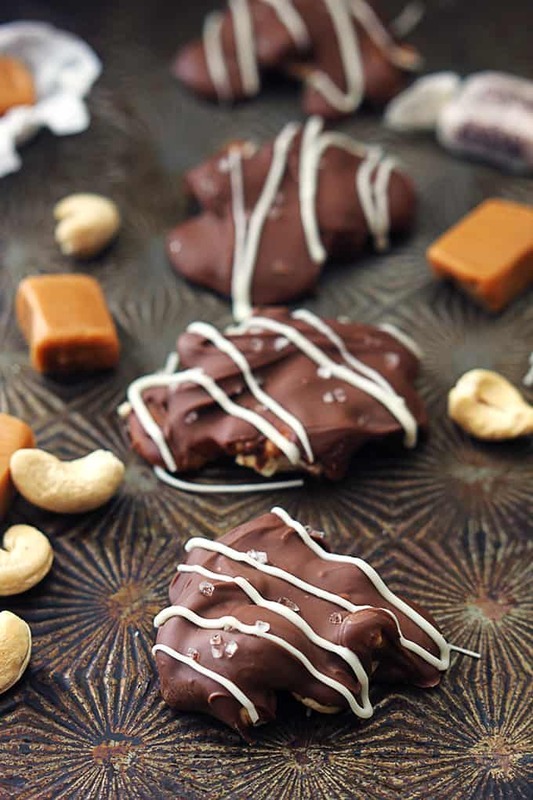 I love cashew clusters and I can’t wait to try these gorgeous, and no doubt, DELICIOUS pieces of heaven! Thanks for the recipe. I’m making these for my next get-together. Oh good God!! These clusters look incredible! You added a tip about the caramels, but did not say what to add. Can you tell what to add? Heavy cream or milk – sorry! In your note section you say, if using the square caramels add 2-3 tablespoons of “what” to the bowl to keep them soft? Thanks, can’t wait to make these. ***tip: if using harder caramels such as the square ones that come individually wrapped, add 2-3 tablespoons to the bowl when microwaving, this will help to keep the caramel soft! what ingredient am i supposed to add 2-3 tablespoons of to the bowl to help kep the caramel soft?? I could get very fat off these evil li’l sweeties.